I met Edward Hayco last Tuesday. It was Valentine’s Day. It was also Ed’s birthday. He was having lunch with Eleanor and his children at Ginza; I was avoiding the V-Day rush by having a lunch date with Jasmin. 1) Dancesport –largest dance class: 7,770 dancers. 2) Fireworks –125,801 rockets launched in less than 60 seconds. 3) Chess – 43,157 players in one event. Well, ever the restless sportsman, Ed is concocting another Guinness attempt. I won’t divulge the details yet but will write about it soon. But, for now, Ed will be happy to hear that Cebu City will be part of another WR attempt on February 25. Called the “Rotary Swimarathon,” we’ll join a global event where thousands will swim simultaneously for one hour. April Dequito, president of the Rotary Club of Talisay – Cebu, is spearheading the project. Here’s the plan: On Feb. 25 (next Saturday) from 8 to 9 P.M. at the YMCA pool (along Osmeña Blvd. ), people will take turns swimming 100 meters. Every swimmer who records that distance will be counted. And, while Cebuanos are swimming in YMCA, thousands of others worldwide — from New Zealand to South Africa to Portugal — will swim during the same hour. “At the moment, we have gathered 50 participants,” said April. “We still need to contact different varsity teams in various high schools. We are allocating two lanes for the 100-meter swim, and the other 2 lanes are for the 25-meter relay (exhibition purposes only as not everyone can finish a 100-meter swim). PWD will also be invited to swim on a special lane. The objectives? Like the Rotary’s famous Four-Way Test, it’s also Four-fold: 1) Set a new World Record for the most number of people swimming at the same time. 2) Raise funds towards the elimination of Polio. 3) Increase the awareness of Rotary. 4) Encourage more people to swim and stay fit. I’m joining. Want to join? Email rctalisaycebu@gmail.com. ROTARY. There are 24 of us from the Rotary Club of Cebu West attending the 50th anniversary of the RC of Singapore West (our club last week held its 48th Induction Ceremony). With us are a mix of sports lovers… golfing buddies Johnny Siao, Justin Uy, John Young and Nilo Domingo; badminton swingers Jimmy Lao, Ruel Dihiansan, Alvin Tan, Bobby Yap and Lenton Beltran. Also here are Romy Dy Pico, Johnson Dy, Wilton Uykingtian plus many of our spouses. And while we thought our “Filipino hospitality” was the world’s best, the Singapore welcome here—including dinners at the Black Angus Steakhouse and Long Beach restaurant (famous for the original Black Pepper Crab)—can be described in one word, which I delivered in a short speech to the Rotarians here: WOW! As expected of a nation whose most-followed game is football, it’s all-World Cup here. What’s terrific about their South Africa focus in the newspapers here—apart from printing the standings, results, TV schedules, Quotable Quotes—are the commentary. They have plenty of columnists here—much like our Noel Villaflor—whose acumen for soccer is outstanding. There’s Gerry Armstrong, Lee Min Kok, and Tay Yek Keak. Rohit Brijnath, whose byline is SPORTINGLIFE, titled his piece, “Messi proof of beauty of decisiveness.” Here’s a sampler of his writing prowess: “Messi has too much skill and thus too much choice: jink, pass, swerve, shoot, feint? But this Cup, more often than not, his thrill has been an ability, under pressure, to select the right gap, person, move. His judgment is so fine it seems he owns a sixth sense, a third eye.” That’s excellent writing. There’s more. Terrence Voon, whom they call “Our man in South Africa,” is literally in SA. He writes first-hand stories of what his eyes see… of the vuvuzela that deafen his ears. YOG. The most-awaited event here happens from August 14 to 26. It’s the Youth Olympic Games. Sanctioned by the International Olympic Committee (IOC), it is the first Olympic games for the youth aged 14 to 18 years old. What a privilege for Singapore to host this inaugural event. USS. Two days ago, we had a free, guided tour of the newest attraction, the Universal Studios Singapore. Like Hong Kong’s Disneyland, it’s a must-see destination… especially for those who love thrill rides. CASINO. Yesterday, the Marina Bay Sands was formally opened. What a sight! Its advertisement sums it up: “Unveiling A New Wonder Of The World.” With three 55-story towers that support the SkyPark (a surfboard-like structure that looks like a ship), it’s an amazing sight in Singapore. Romy S. DyPico did the unthinkable last Friday night. While attending the Rotary District Conference, Romy, the president of my club, the RC of Cebu West, scurried near the front stage and tiptoed to sit beside a lady for that one-click photo moment. We were in General Santos City along with 1,200 other Rotarians from District 3860 when President Romy posed beside Ms. Seductive. Who was she? Mommy Dionisia. The Discon was fun! Apart from attending the successful event (kudos to District Governor Tony Veneracion) and gorging on tuna in the Tuna Capital of the Philippines for four days until yesterday, we did one more act: we saw the empire of King Manny. As soon as we landed in “Magandang Gensan” last Wednesday, our driver whisked us to see the city’s most publicized landmark: Pacman’s house. House? Sorry. It wasn’t; it was a mansion, a castle, a palace equipped with a blue pool that’s shaped after his red glove. We visited Robinson’s. After lunch at Grab-A-Crab, we strolled along the mall’s corridors. Together with my Rotary club’s past presidents, Wilton Uykingtian, Maxwell Ahyong and Ronnie Medalle, I toured the Food Court. 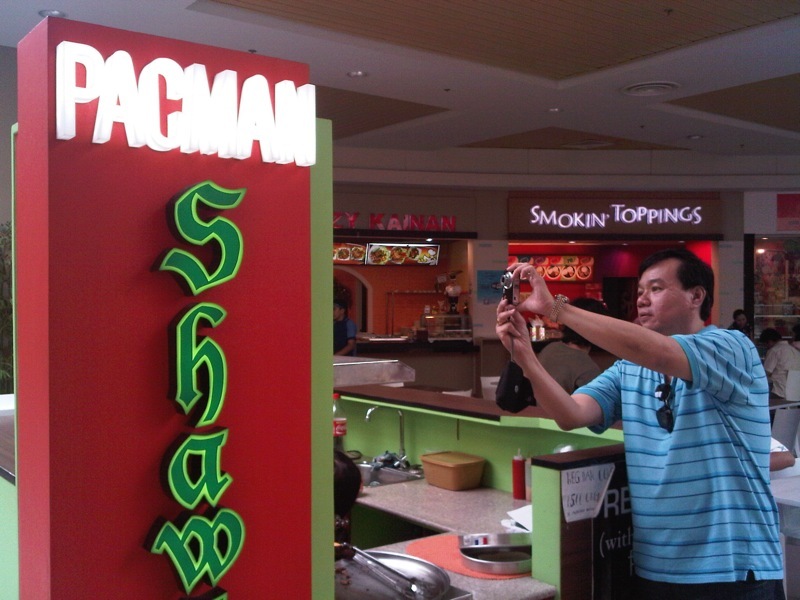 There, at the center, stood another landmark: Pacman Shawarma. Yes, like our beef-and-pita stands in Ayala and SM in Cebu, it was the same take-out food stall owned by a boxer who’s job is to take-out opponents. 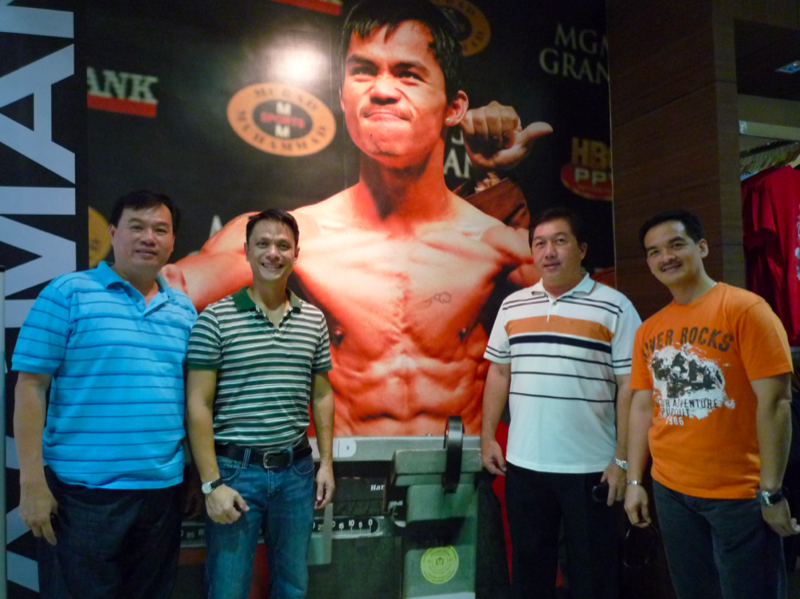 Next, we entered TEAM PACQUIAO. It was a museum and souvenir shop bundled into one. The white pair of shoes Manny wore against Juan Manuel Marquez sat on the open shelf. Everything MP was found there: mugs, towels, CDs and DVDs priced P99 and P150, keychains, a pair of Nike shoes worth P8,000. Picture frames of MP adorned the walls. A pair of boxing gloves with his signature could be yours for P15,000. There sat trophies, jackets, T-shirts with the words “Now You Know.” A Victorinox watch was priced P30,000. Right beside was Blue Gre Cafe. Known for its Durian Gatchpuccino, it’s owned by… now you know… Mr. and Mrs. Pacquiao. Next, we toured the city. One building stood out. 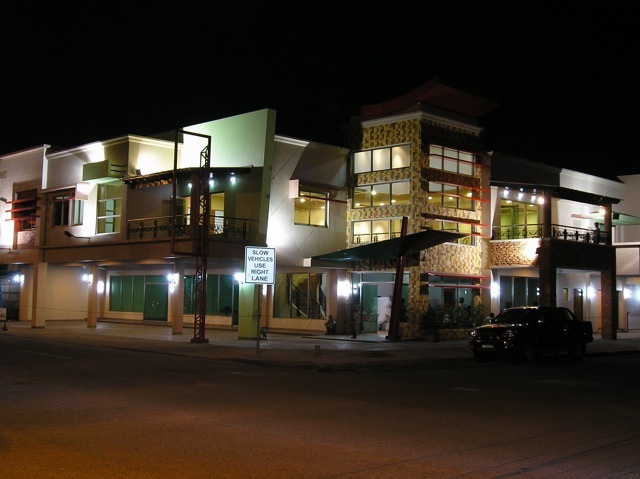 The two-story structure was colorful, eye-catching, modern and named JMP Building after the initials of its owners. For here’s what I witnessed: Manny P. has transformed himself into more than just the world’s No.1 boxer. He’s a promoter. An actor. A singer. A Rotarian honorary member of the RC of Midtown Gensan. A congressman? Most of all, he’s a businessman. That’s what we saw, our group from the Rotary Club of Cebu West led by Past District Governor Toto Cupin, president Romy and his wife Julie, past president Ex Bollozos and his wife Cynthia, and our past president (and current District Trainer) Philip Tan. 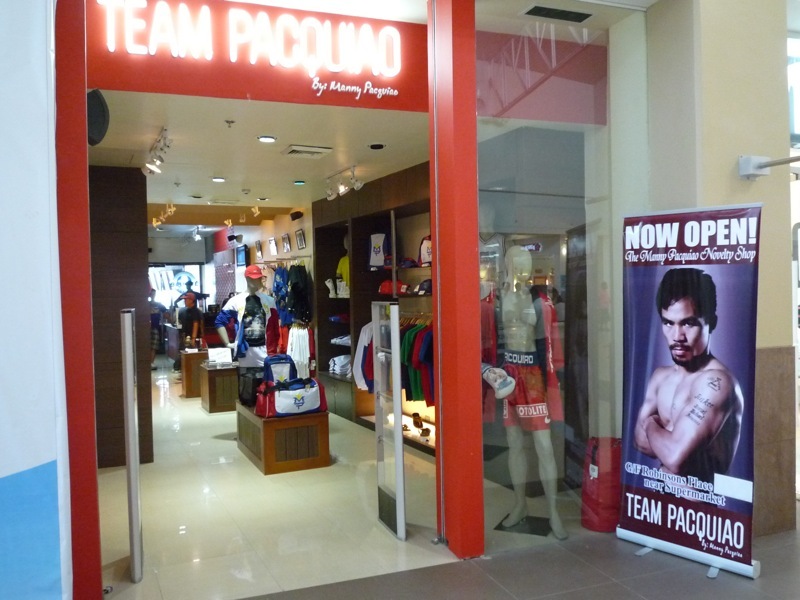 Pacquiao has a myriad of ventures. There’s Pacman H20. 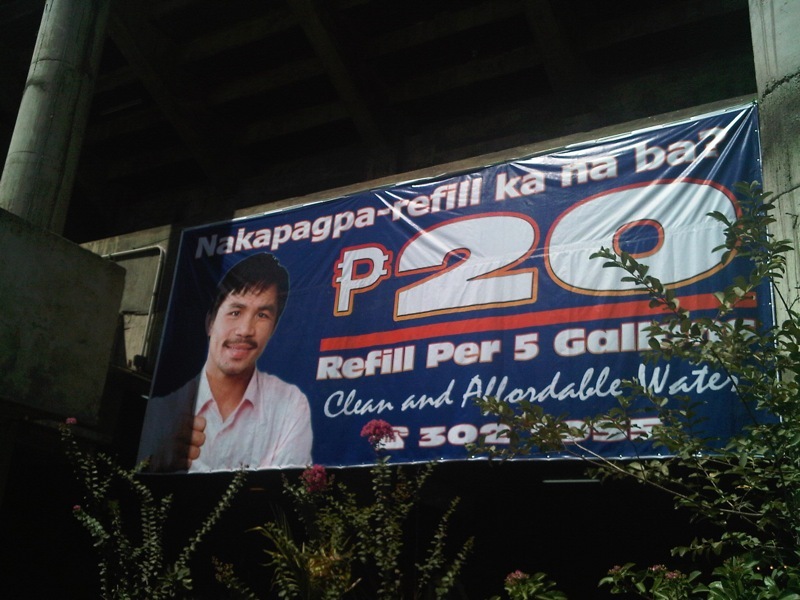 Promoted as the “Pambansang Tubig,” Manny’s photo is on all the plastic water bottles. 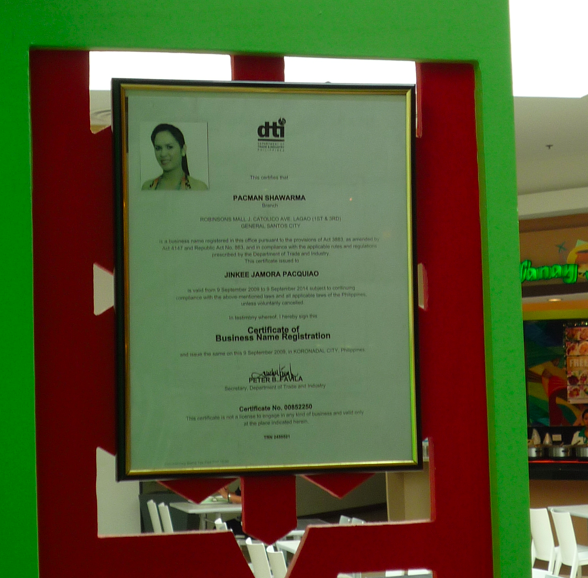 At the KCC mall, Jinkee has two stores: a fashion boutique and a franchise of the beauty clinic, Flawless. They also own a gas station. The JMP Bldg.? That’s Part One. There’s also JMP Bldg. 2 and, last Friday, after the dancing and revelry of the Rotary Discon party, we sojourned into the corner building along Aparente Avenue. On the ground floor of JMP 2, a collection of Manny’s photos lined the walls. 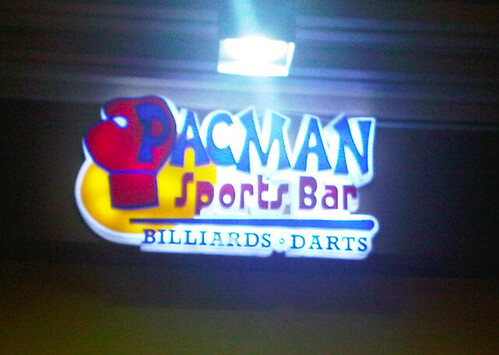 At the corner was “Pacman Sports Bar,” a venue to drink while playing two of Manny’s favorite pastime games: billiards and darts. JMix is on the second level and, complete with dancing lights and ear-splitting music, it’s the newest disco-bar Gensan hangout. To top all these, when our Rotary group toured the Fishport two afternoons ago, we passed a construction site. 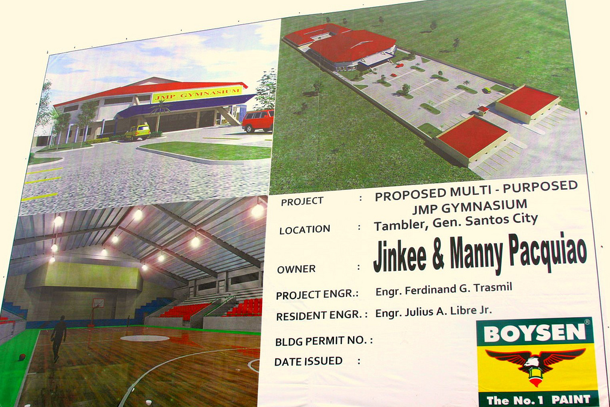 Located in Tambler, it reportedly costs P20 million and will house four buildings including a covered basketball court and a world-class boxing facility. It’s called the JMP Multi-Purpose Gymnasium. Now, imagine if, seven days from this morning, Manny beats Joshua Clottey and, later this 2010, gifts ‘Money’ Mayweather with his first loss? Manny and his money will own the city. “Rotary is a worldwide organization of more than 1.2 million business, professional, and community leaders,” says the official website, www.Rotary.org. “Members of Rotary clubs, known as Rotarians, provide humanitarian service, encourage high ethical standards in all vocations, and help build goodwill and peace in the world. Here in Cebu, there are a total of 26 Rotary clubs and, starting Sunday, one of the highlights will commence… The Rotary Week. RUN. 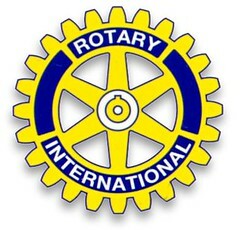 To give the Rotary Week, literally, a running start will be the “2ND ROTARY RUN” this Feb. 21 (Sunday), at the SM City. Founded by Andrew Jimenez last year (Andrew has since relocated to Sydney, Australia), it is now jointly handled by two running buff Rotarians: Kenneth Casquejo (the past president of the Rotary Club of Banilad Metro) and Jet Neric (my fellow Rotarian, and our secretary, at the RC of Cebu West). Cash prizes, trophies and medals will be awarded to the Top 10 finishers per category. Special awards will also be handed out to the biggest Rotary delegation, the biggest Non-Rotary delegation, the oldest/youngest runners, the best running couple, the best running family and the best in costume. This event is jointly organized by the RC of Banilad Metro and the RC of Cebu West (headed by my club’s highly-progressive and enterprising president, Romy DyPico). Registration is now going on at the PSC office (9 a.m. to 5 p.m.) in Abellana, Toby’s SM City, Colette’s Buko Pie SM and RUNNR in Ayala. Registration Fee is only P150 and the deadline is this Thursday. See you there this Sunday, 5:30 a.m., at the SM North Parking Area. BOWLING. The “Rotary Week Fun Bowling Tournament” is next Tuesday, Feb. 23, and is open to Rotarians and their family members. Venue is at the SM Bowling Center and the competition starts at 7 p.m. Prizes await the… Team Champion, 1st, 2nd, 3rd Runner Up, Highest Single Game, Biggest Delegation. The hosts are the clubs of Central Mactan and Cebu Fort San Pedro. For more details, contact RC of Central Mactan PP Udo Pelkowski at 09172791907 or udopelkowski@hotmail.com. GOLF. Open to Rotarians and non-Rotarians, the Golf Fellowship is next Wed., Feb. 24, at the Mactan Island Golf and Country Club. Tee off time is from 7:30 to 11 a.m. Registration fee is P1,500 and, to join, call Fe Escaño at 0927-4132923 or 0922-7862681. 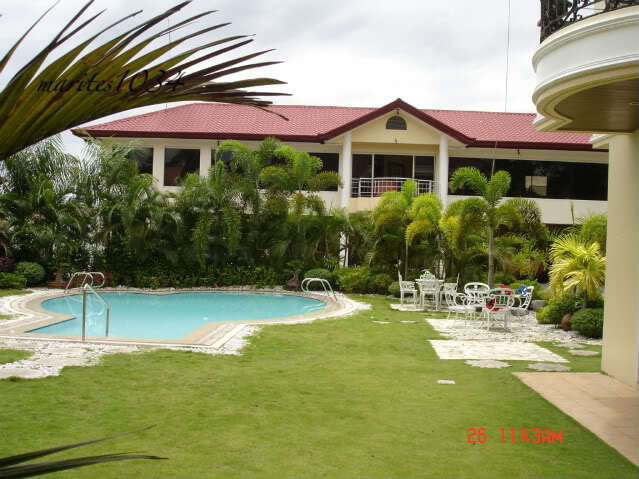 Host club is the Rotary Club of Cebu Port Center. ROTARY WEEK. Chaired by Rotarian Ricky Poca with Lilu Aliño as the PR Chair, the Rotary Week (from Feb. 21 to 28) will also include these non-sports activities: Holy Mass on Feb. 21 at 9 a.m. (SM City)… Humanity In Motion Exhibit (from Feb. 21 to 28) at the SM City Northwing… A Dog Walk and Veterinary Medical Clinic on Feb. 21 (SM parking area)… On Feb. 24, an Immunization Day at the Brgy. 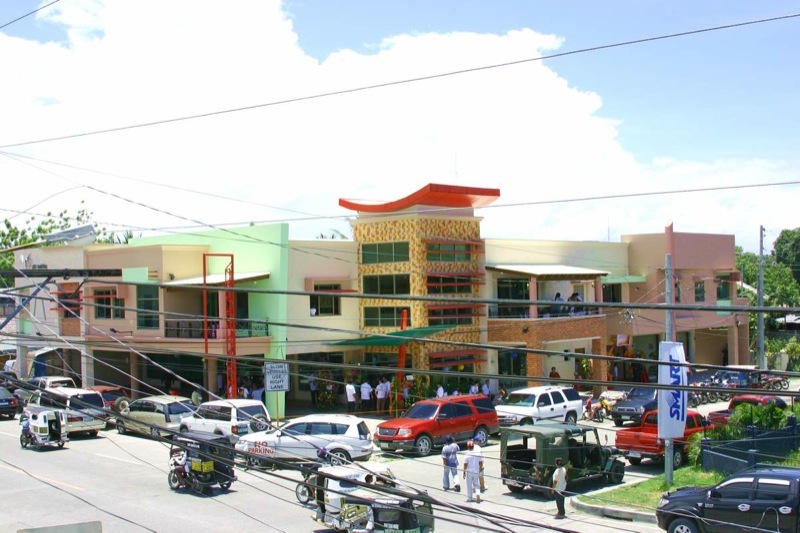 Ermita Multi-Purpose Hall (headed by RC Banilad Metro)… On Feb. 25, a Voter’s Education program (spearheaded by the RC of Cebu) at the USC Main Campus from 9:30 to 11:30 a.m… A Rotary Chill-out Nite at The Terraces of the Ayala Center on Feb. 25… And, on Feb. 27, a Grand Fellowship at the Capitol Social Hall. Enjoy ROTARY this coming WEEK!